As with all aging pets, there comes a time when the difficult decision to ease their suffering must be made. And after a few months of slowly declining health, on December 5, 2012 it was his time. Many of our clients will remember Solja keeping watch from behind the reception desk. Or graciously welcoming guests to “Soldier Park” (named for him) during “Yappy Hour”. Solja warmed the hearts of each and every one of our staff and we will truly miss our sweet friend. Solja was rescued in 2007 from the streets of St. Croix by the Warden, Odey Constant, of the St. Croix Animal Welfare Center. He was in a state of severe starvation and dehydration after being abandoned by his family who moved off-island the year prior. He was skin and bones and could only lift his head. He captured the heart of Dr. Jung, as the entire shelter staff worked hard to provide him with nursing care and rehabilitation therapy. 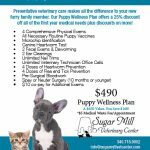 Solja Boy was adopted by Dr. Jung to live at the Sugar Mill Veterinary Center. Slow and steady progress proved successful! For a year he used a cart (wheelchair) for support, which allowed him to slowly regain strength in his back legs. In 2009, after careful thought and study about the painful elbow in his left front leg, the decision was made to amputate. Solja was happy and pain free! He agreed to take the roll of ‘Resident Guard Dog’ and spent his days patrolling the Mill’s grounds. We estimate that Solja was around 12 years old at the time of his passing. He is survived by his best friends, resident Sugar Mill dogs, Lester and Agnes. He will be missed dearly by all who knew him, especially the staff at SMVC. He was a beloved staff member, guard dog… and friend. Solja is buried on the grounds of SMVC by Soldier’s Park, the dog park named for him. 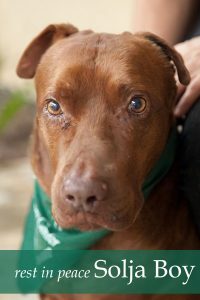 Donations may be made in his name to fund the rescue and rehabilitation of other abused and neglected pets on St Croix via Sunshine Foundation.